IKEA’S Cook This Page, an in-store promotion in Canada, has won a Grand Prix award at the Clio Awards. 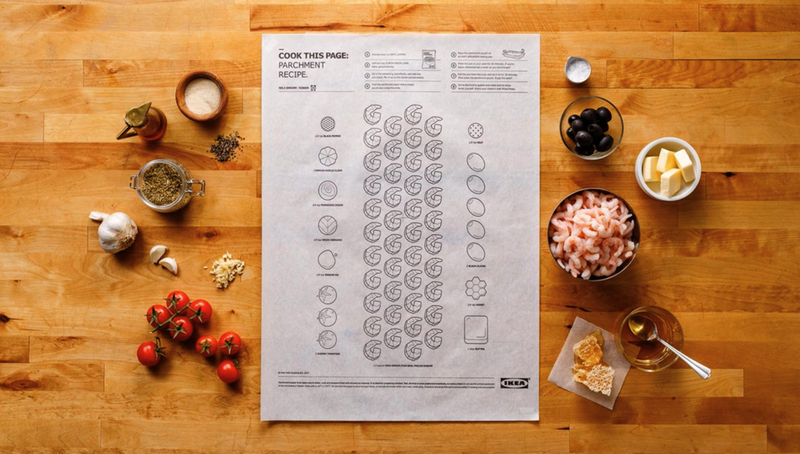 The IKEA Cook This Page campaign involved a set of printed recipe sheets distributed to IKEA stores to encourage use of IKEA kitchenware and food products. “The Cook This Page Parchment Paper Recipe Series,” a collection of easy-to-make recipes printed on cookable parchment paper. With step-by-step instructions and a list of ingredients precisely illustrated on the parchment paper to match actual proportions, the only thing one had to do was add food, roll it all up and bake it. The sheets are printed with food-safe ink. 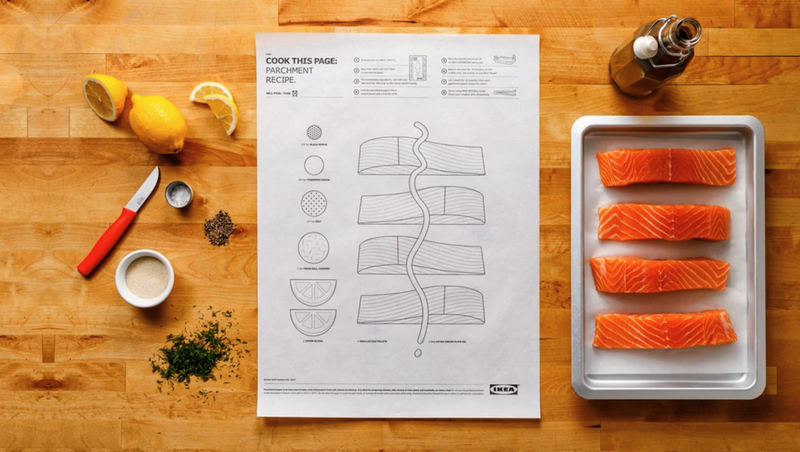 With the fill-in-the-blank directions, you can place the salmon, meatballs, shrimps, fruit crumble and other ingredients inside the printed layouts. Finally, roll up the paper with all the ingredients and get ready to cook your meal. 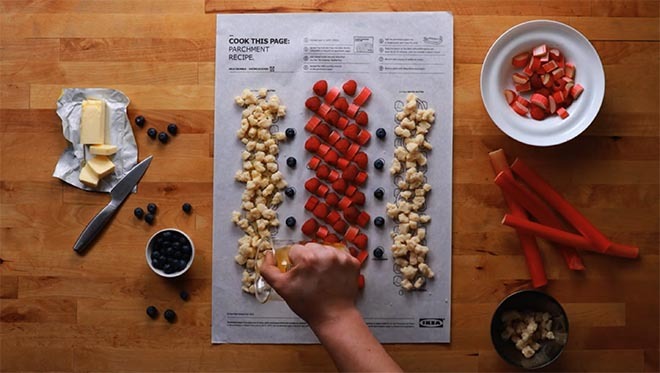 IKEA store managers created in-store events across Canada to show that cooking can be fun, simple and exploratory. Posters were offered to customers as they selected kitchen ware and ingredients. All 12,500 parchment paper recipes available in 18 locations were snatched up within hours. 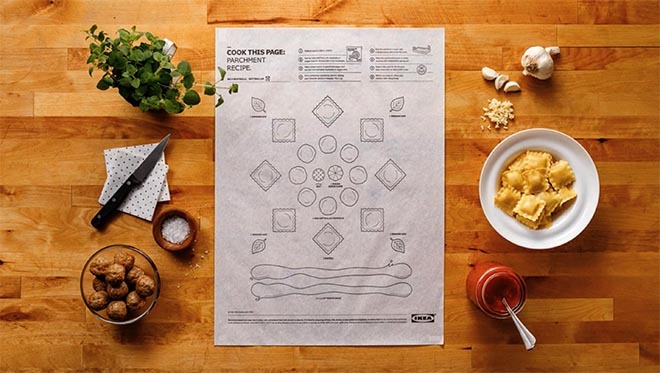 The IKEA Cook This Page campaign was developed at Leo Burnett Toronto by chief creative officer	Judy Johns, creative director Lisa Greenberg, group creative director/art director, designer and illustrator Anthony Chelvanathan, group creative director/copywriter Steve Persico, senior graphic artist Robin Osmond, executive producer Franca Piacente, agency producer Alexandra Postans, print producers Good Cathmoir, Anne Peck and Carly Price, group account director Allison Litzinger, account director Emily Robinson, account supervisor Rebecca Simon, chief strategy officer Brent Nelsen, VP group planning director Tahir Ahmad. The Cook This Page kits were printed at Printed By Somerset / Mississauga, using paper from Papertec Inc and ink produced at Trade Graphics By Design Inc. Photographer was Arash Moallemi at Fuze Reps. The video was produced by videographer Jonathan Lajole, food stylist Matthew Kimura, editor David Nakata, with music by Grayson Matthews.